Canada AM ran a piece this morning about the ‘Red Fridays’ organizers having created some scrapbooks to document rallies they organized and inspired, and media coverage they attracted. The scrapbooks have been sent to Canadian troops in Afganistan. 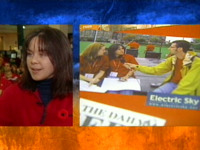 During the segment, CTV split the screen to show the interview with Red Friday co-organizer Lisa Miller in one window, and pages of the scrapbook in the other. It was hard to miss my yellow jacket when they showed a photograph of me interviewing Lisa and co-organizer Karen Boire for an episode of Portrait. Best wishes to all of our troops for a safe return, and thank you to all of Canada’s veterans!